Feel the magic of taking flight before you even board an airplane at the Heathrow airport with Burberry‘s magical new installation. 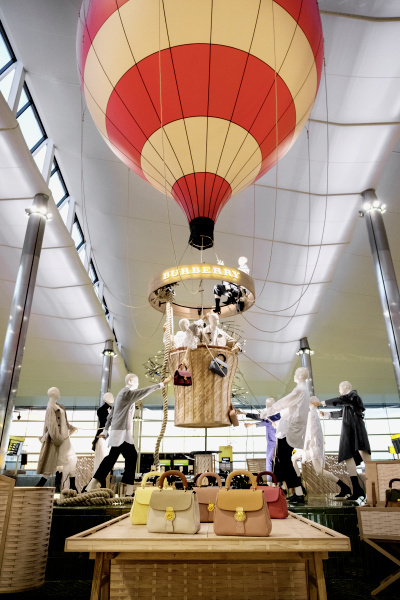 In the departure lounge of Heathrow Terminal 2: The Queen’s Terminal, a life-sized hot air balloon towers 15 feet tall above the millions of passengers passing through the airport. The aptly named Burberry Balloon is inspired by the remarkable achievements of Air Commodore Edward Maitland who set the record for Britain’s long-distance inflight journey in 1908 by travelling 1,117 miles from the Crystal Palace in London to Russia with fellow voyagers, Auguste Gaudron and Charles Turner. During this monumental flight over land and sea in the Mammoth balloon, Maitland wore Burberry gabardine suiting that protected him from the bitter cold at high altitude. 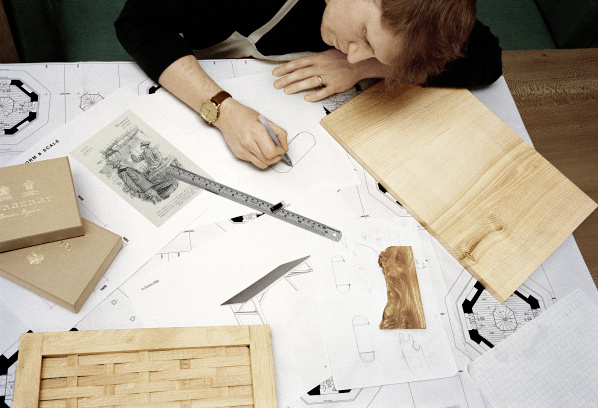 Thus, to celebrate this magic of flight, the British luxury brand presents the awe-inspiring installation outfitted with dedicated iPads and Burberry post boxes that let travellers create and print their own Burberry postcards and send them to friends and family all over the world. These cards are given a bespoke touch with illustrations and inscribed with the passenger’s name and travel destination. 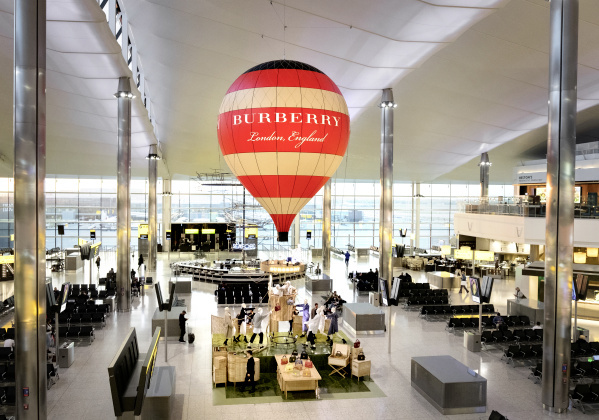 Those who prefer the immediate effects of social media can share an animated video of the Burberry Balloon and its journey from Heathrow to the chosen destination on their personal social media channels. Accompanying the Burberry Balloon is a pop-up store that showcases the best of the British luxury brand with bags from their DK88 collection, named after the house code for its signature honey-coloured gabardine. The DK88 comes in top handle, satchel and luggage-inspired styles for men and women, each featuring Burberry’s exclusive new Trench Leather.